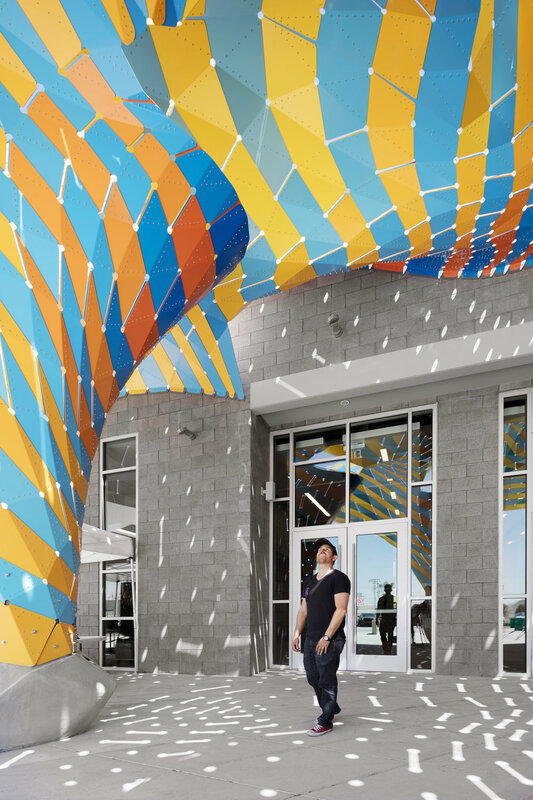 Marquise is a spatial entry structure for El Paso’s Westside Natatorium. A visual icon and architectural threshold, the lightweight aluminum structure transforms the approach and experience of this new public building. 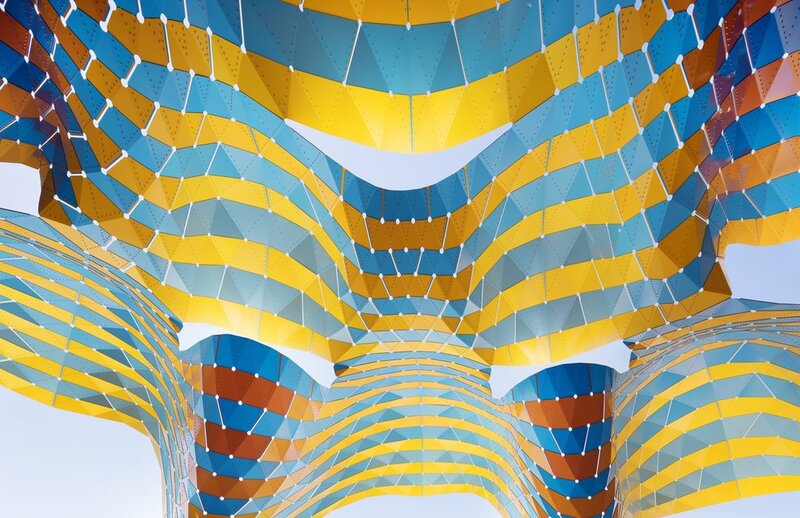 Gridded curvilinear panels comprise the brightly-colored canopy and as well its self-supporting structural system. A two-way Cheshire gradient in deep blues and warm yellows alternate graphically to emphasize the sweeping surfaces. Seemingly inflated by the wind, as a tent or sail, the ultra-thin surface billows up from the ground, where it forms two contiguous seats: cast in place concrete elements that inherit the compound curvature of the faceted but flowing surface. Marquise strikes its visitors differently: for small guests lining up for swimming lessons, the surface overhead appears to be some kind of circus tent, or a parachute frozen in midair. A bit of excitement before it’s time to suit up. Older patrons might find a welcome moment of pause at this shady entrance, before water aerobics or heading back into the heat of the parking lot. Under dappled light, we've carved out a place that isn't just for coming or going, but for lingering. At all hours, the space under and around Marquise welcomes moments that stretch into longer durations. When you're waiting for your ride or meeting the swim team, outside the Natatorium is a place to chill out before dipping in. Before 6am laps to after dusk, Marquise alternately shades and radiates for pool-goers and all others. The structure almost insists upon loitering -- why wouldn’t you want to hang out there? 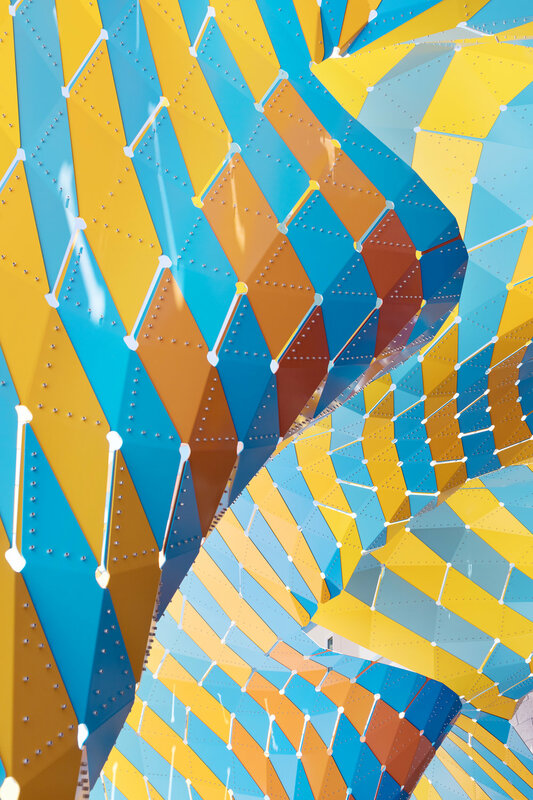 Gradients in a set of rich yellows and deep blues follow the A/B patterning of dual-faced surface. Two complementary strategies unite to create a third condition--something richer. Playing off the fluctuations between warm and cool in the desert setting, the coloration saturates the palette of the surrounding landscape. 240 unique parts are painted in six shades of blues, from a bright midday sky to a deep, clear dusk. Another 280 shingles are painted in five shades of golden yellow to earthen orange. 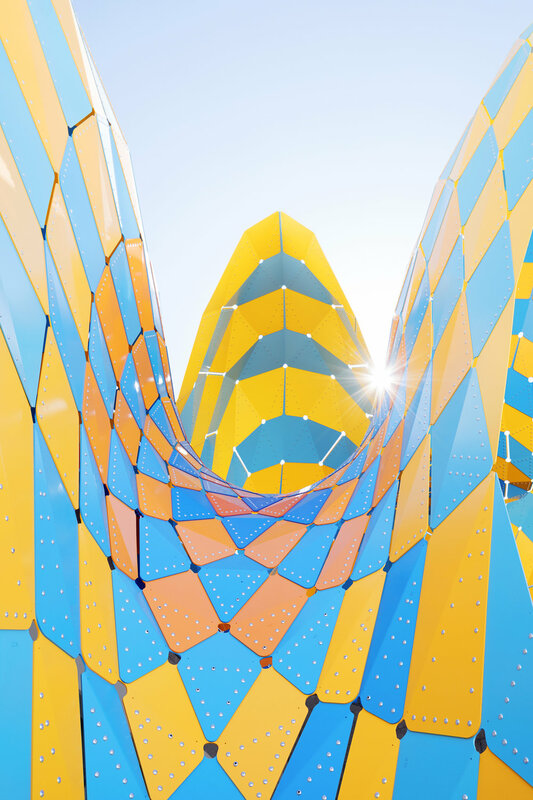 Individual parts come together to form larger macro-shingles that drop down into columns or peel up into expressive light scoops. These openings project over the surface below to capture light but not direct light -- maintaining shade, but not darkness under the South Texas sun. Marquise represents the studio’s interest in maintaining the thinnest possible surface that can self-support. This is achieved through compound curvature, but also the description of that curvature into integral parts: structural shingles in two different thicknesses -- ⅛ inch aluminum with local moments of reinforcement at 3/16 inch assume the doubly-curved canopy in subtle facets. Overlaps allow for partial double thickness along continuous running bonds, which provide better resistance to point loads. For the studio, structure is always conjoined to other expressive and experiential capacities of the articulated surface. In this case, we present a 21st century take on the art nouveau entrances of the past century--borrowing the name but shifting its definition. 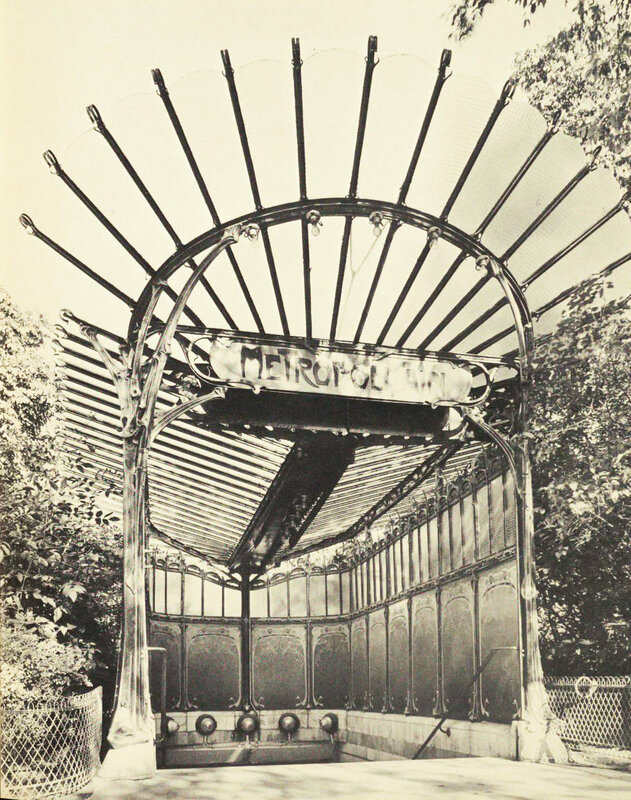 A marquise is historically classified as a curvilinear steel and glass awning, attached to buildings or freestanding as those made famous by Hector Guimard for the Paris Metro at Porte Dauphine and Abbesses. Our Texan Marquise plays on an inversion of the characteristic tectonics of the Parisian original: rather than sculptural wrought iron framing delicate glass panels, ultra-thin aluminum takes the place of glass and the frame as one unified structure. Light enters not through the panels, but between them, where they connect, casting spritely patterns across the interior of the canopy. Beyond momentarily shielding you from rain or the sun, the marquise celebrates the moment where the building meets its public. Marquise is an original Artwork owned and commissioned by the City of El Paso.